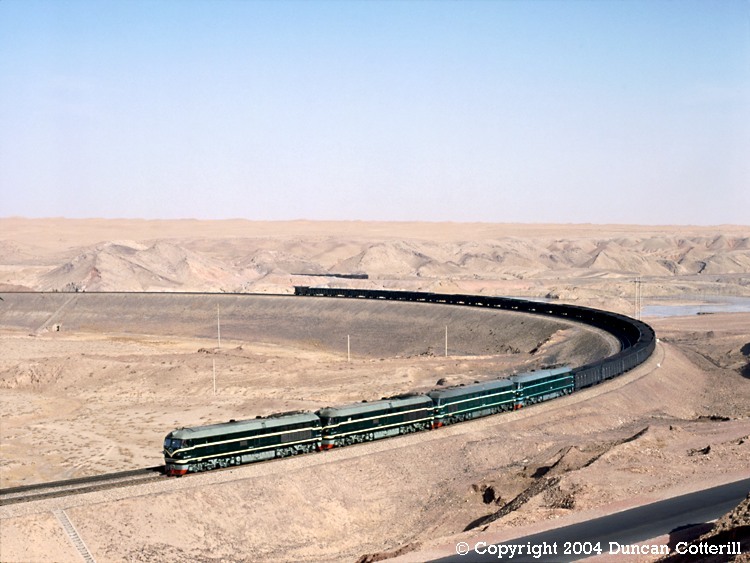 By January 1994 the writing was on the wall for steam operation on the line between Zhongwei and Gantang. Zhongwei had got its first DF4s the previous autumn and more were on their way. Having seen the Lanzhou - Dijiatai and Hexipu - Zhangye sections go diesel very quickly in earlier years, we expected the worst - lots of shiny DF4s and few QJs. The reality was somewhat different. On our first morning four DF4s came up the hill on a coal train but two of them never came back. The remaining diesels managed to work one uphill train a day but traffic had increased and there were actually more steam workings than in previous years. Unfortunately, it didn't last and by the following winter, Zhongwei was off the agenda. DF4 3605, DF4 3556, DF4 6145 and DF4 6117 rounded the big curve below Changliushui with a westbound coal train on 9 January 1994.